You may have heard the phrase that one person’s trash is another person’s treasure. It amazes me how often that is true! Even though not everything comes from an actual trash can, thrift store items are basically the same thing. The items that are donated to thrift stores are because they are unwanted and discarded. This makes thrift stores a great place to find items to turn into treasures. In my case, however, I came up with a trash to treasure project from an item that was simply given to me. My husband’s grandparents had lived in a beautiful old farmhouse with tons of character. However, a large company wanted their land to build on it. Sadly, after selling the company their farmhouse, the farmhouse had to be torn down. Before it was completely demolished, my in-laws went into the house and saved some of the unique architecture as keepsakes. 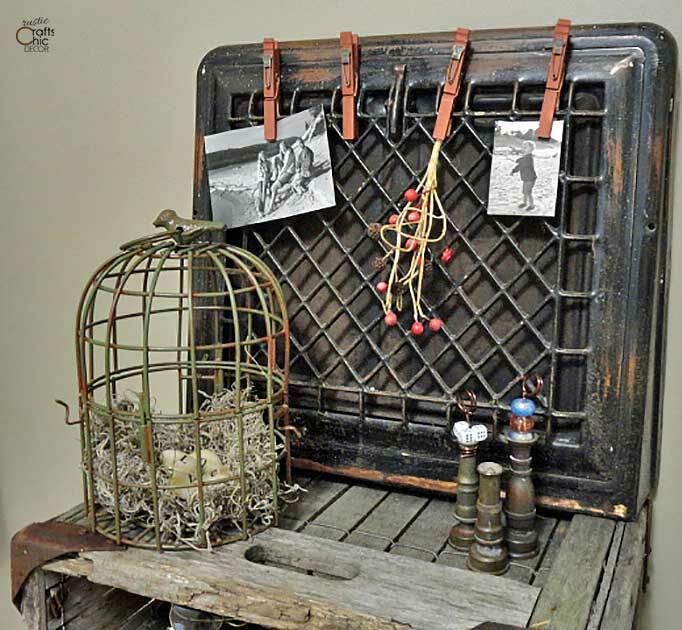 Because they knew of our appreciation for salvage materials, they gave us some cool pieces. One of those was an old heat register. I am so happy that they had the fore thought to do this. Although I had no idea what I would possibly do with an old heat register, I love the cool look of it. The metal patina is so rustic looking and the diamond grid pattern on the front did show some possibility. After thinking on it for a little while, I determined that the heat register was a perfect size for a handy clip board. So, my trash to treasure project is simply to convert the use of the register to a new life as a clip board. Since the heat register is stable and can stand on it’s own, I didn’t need to add anything to prop it up. It is also the same width as my crate bookcase which makes it a perfect addition to the top. All I really had to do, with the register itself, is clean and sand it. When I sanded some of the flaky rust off, I was left with a smoother surface. The rusted surface below became more vibrant and rich. Of course, to make the register into a clip board, I still needed some clips. Because of the patina on the register, I painted some clothespins in a complementary metallic copper color. 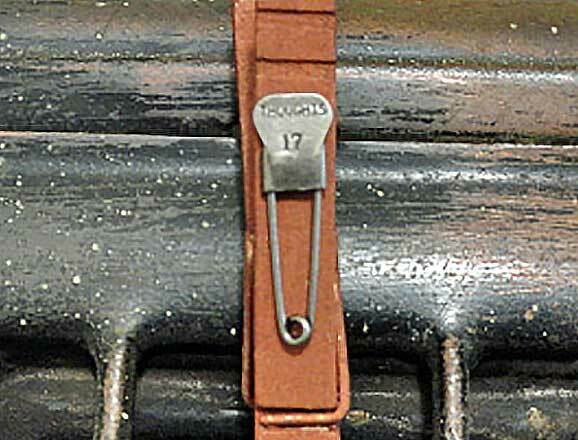 Then, to add a bit more metal to the clips, I glued on some Tim Holtz rustic safety pins. I am loving the fun look that this new clipboard gives to my shabby office space. And, the sentimental value just adds to the overall appeal. An Old Book Is Turned Into A Picture Frame – There is no need to throw out old books when you can upcycle one into a fun picture frame. See how I used a vintage book cover to create a rustic picture frame. 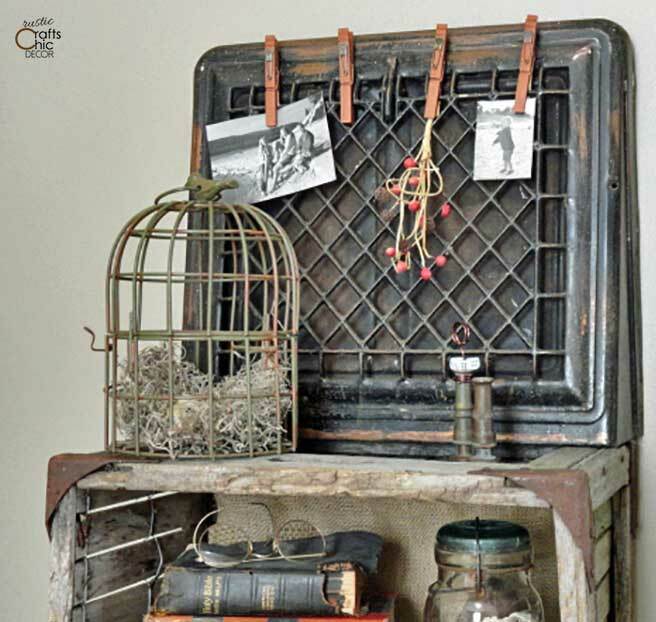 A Whole Collection Of Upcycling Projects Using Flea Market Finds – A surprising collection of ways that you can turn old items into new treasures. Simply gorgeous! Super great idee to embellish the cloteshpins as well. LOVE IT!!! 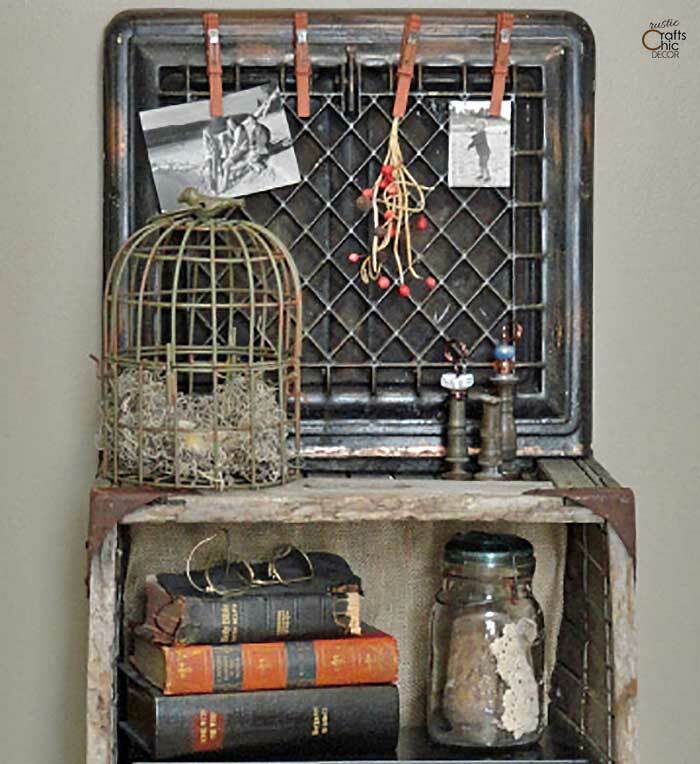 What an awesome idea and it looks great sitting on the crate bookshelf! What a find! My favorite part is that it has a back story. I love incorporating things that belonged to family. Thanks for sharing! I love that part too and am grateful for the keepsake 🙂 Thanks for stopping by! Awesome! I just love it. You did an amazing job! I would love for you to link up at my Linky Party. this is absolutely wonderful! I want one! !~love finding a place for something old! Great idea! I have an old grate and have been at a loss for what to do with it! Unbelievably cool!!! I love the look and the story about it is priceless! Thanks so much Rain, Cynthia and Katie! Thanks Jill! I will do that! I came from Katherine’s Corner to give you a wink. I’m enjoying your blog and wont stop, I will now continue to do the hop!! Now that we met come follow me, on my….. GFC…. Stopping by from the Thursdays Favorite Things Hop! cool! I have one of these to do too; can’t wait to start playing. Yours turned out great!! That’s cool! Have fun with it and let me know what you do! Very creative of you and a terrific vignette! Thank you for sharing at Potpourri Friday! I appreciate your participation!